Ultra compact all in one device with 650mAH internal battery, 2ml tank capacity, and automatic activation when inhaling. 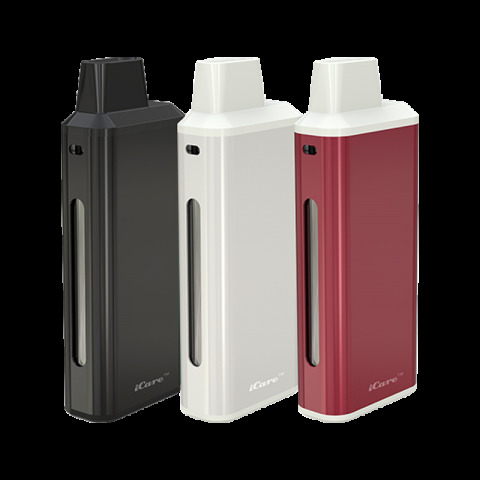 Eleaf iCare Starter Kit is a compact e-cigarette starter kit with an internal tank and airflow system. It is quite simple to use for the automatic On/Off feature that initiate when vaping. The e-liquid can be refilled into the tank from top with ease. By using a higher strength e-liquid, the iCare perfectly recreated the sansation you are accustomed to. Also with intuitive three color LEDs, you can easily check the battery status by a simple glance at the color of the light. The 650mAh battery supports about 400 puffs vaping.